CHARLOTTE!! 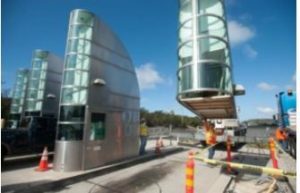 Like it or not, the first of 5 toll roads is now open. At 10am on 11/27, The Monroe Expressway portion opened to the public. This $730 million dollar deal has been a long time coming. It’s an 18 mile stretch that parallels Hwy. 74 moving East to West. It starts in Marshville and ends at I-485. You can possibly save 20-40 minutes, depending on where you’re traveling to and from. The expressway will have 6 interchanges and 14 toll zones. The hope is to get drivers on and not stop until they choose to. No need to pull out your wallet or dig in between the seats to find change. You can either purchase an NC Quick Trip or they take a snapshot of your license plate and send you a bill. Once the fees for the construction of the expressway are paid off, the tolls will go away. But that is not expected until the 2050’s. Happy Traveling!